A new alarm sensor claims to need no alarm panel. By integrating a common motion detector and a GSM dialer, Alpha Aresenal's Express GSM sensor 'take the complexity out of alarm systems' by simply hanging it where needed with no additional configuration required. Is this product useful, or is it just a problem waiting to happen? We take a deeper look inside. Alarm sensor manufacturer Alpha Aresenal demoded a line of 'self sufficient' PIR alarm sensors at the recent ASIS show that combine basic detection features with cell dialers, resulting in a sensor that alerts specific numbers when tripped. Unlike traditional sensors that communicate with a central panel as part of a system, the Express GSM sensor needs no other equipment installed to be useful. You can only arm or disarm by clicking on a keyfob (like a car key). Users essentially need to self-monitor - the sensor is not compatible with central monitoring stations. PIR Range: The 3-zone motion sensor has a range of 30 feet in a cone pattern, and the sensor is designed to be wall-mount only. While the zones are not adjustable, the sensor is adjusted to be 'pet resistant' and is tuned to alarm on masses larger than 30 pounds. Remote Communication: Instead of closing an alarm loop via relay contacts, the Express GSM sends notifications via SMS text messages and phonecalls. The messages are simple and straightforward, simply noting the sensor name/ID in alarm condition and timestamp. Up to 6 different numbers will be called at 30 second intervals, until the sensor is disarmed. Keyfob Controller: A keyfob controller is required to arm the system, and no provision to arm remotely is currently available. Cell Not Included: A local carrier SIM card is not included, and the expense of the service is not included in the purchase price of the sensor. The onboard GSM-900/1800/1900 radio is compatible with most CDMA/3G/4GLTE SIM card chips. Cost: The Express GSM sensor costs $99.00 per unit, and includes one keyfob and C123. The additional cost of the SIM card/cell account adds between $10 - $25 USD per month, and coverage depends on local GSM service available. Above all else, the Express GSM is an low cost-of-acquisition, simple alarm detector for a 'one-off' system compared to the installation of a full-blown panel based system. The ability to 'peel and stick' an alarm sensor in place inside a remote area takes much less effort than wiring and installing a traditional system. Because the sensor is battery powered, no additional electricity is needed. For applications like remote shop buildings or 'one-off' deployments, the Express GSM is much less expensive than purchasing an alarm system. Compared to alarm panel programming designed to be configured by trained technicians, setting up the Express GSM for use is simplified and easy for DIYers to configure from a web based configuration page. The $99 acquisition /~ $15 monthly connectivity cost is much less expensive than 'traditional' panel systems costing hundreds of dollars in hardware and labor. Even when those systems only contain a few sensors or a single alarm loop, hardware overheard costs of a central alarm panel, power supplies, and cabling can approach $200 - $300 even before considering installation costs. First, the sensors are not scalable - meaning each sensor is treated as an unique alarm system. Even if a user employs multiple sensors, they are armed/disarmed separately from one another, and unlike a panel based system, are not compatible with most central monitoring stations. Unlike GSM modules installed with panels that may connect the outputs of many sensors into one cell account, each Express GSM sensor must have it's own mobile account, and the cost of deploying multiple sensors gets costly. Another marked disadvantage of the system is that the included PIR sensor is not outdoor-rated, and is a basic 3-zone wall mount-only detector. 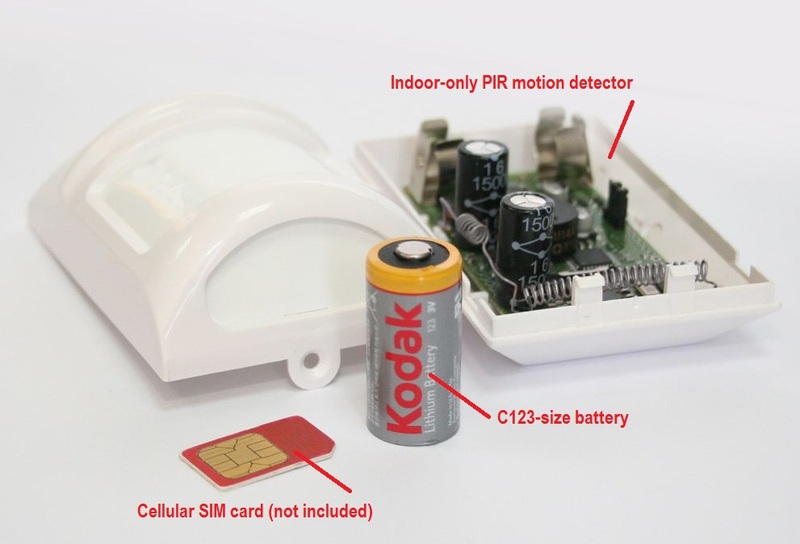 This effectively limits application of the sensor to hallway / corridor applications, and excludes the huge range of outdoor or whole room applications that specialty PIR sensors are commonly deployed. While the battery operated sensor allows flexible deployment, while commercially available, is designed for multiple months of service but must be changed at the sensor. No 'low-battery' alarm notification is provided, and the installer must be proactive to prevent units from hanging dead without notice. Finally, losing the keyfob is a huge risk. 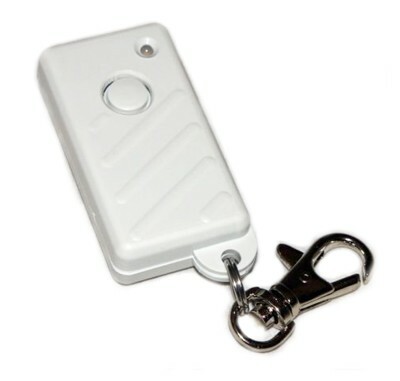 The keyfob is the only manner through which the sensor can be armed. By using the sensor's web client or free mobile phone app, a user can disarm the sensor but cannot arm the unit. The image below shows the standard keyfob included with the Express GSM, although other styles and multi-unit controllers are available. The sensor has the best fit for temporary deployments, such as seasonal storage or job site trailers and equipment areas. Unlike a traditional 'panel based' alarm system, the Express GSM requires no electric utility or protracted monitoring agreement. However, the limitations in sensor choices, the lack of system scalability, and the fact alarms cannot be centrally monitored negate many of the benefits a panel system provides. For a system requiring only provisional intrusion detection with one point, Express GSM could provide a novel solution. However, for more substantial security applications that still have a need to be temporary, solutions like Centurion's Scout II intrusion system are a better fit.